EASO’s Early warning and Preparedness System (EPS) is a data collection system gathering information under indicators focussing on all key stages of the Common European Asylum System (CEAS). Countries provide monthly data to EASO within 15 days, with all 30 EU+ countries (EU Member States plus Norway and Switzerland) contributing. 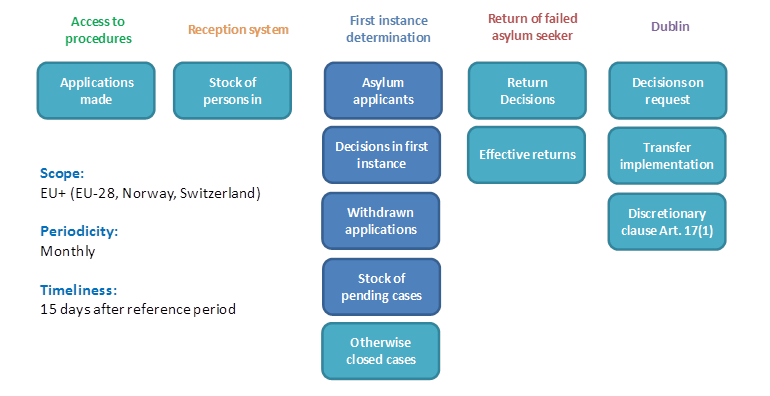 As the CEAS is a complex process, the roll-out of the data collection is envisaged to proceed in stages: Stage II, launched in March 2014, focuses on the first instance in the asylum process and collects data under four indicators: applicants, withdrawn applications, decisions, and pending cases. Stage III, launched in September 2015, focuses on access to procedure, reception, Dublin and return. In developing EPS indicators, every effort is made to make them as consistent as possible with existing migration statistics collected by Eurostat under Regulation (EC) No 862/2007 — EU statistics on migration and international protection.